When I was a kid, the Italian lunch ladies would sometimes serve up trays of pizza: fat slabs of rich yeasty crust slathered with oregano-spiced tomato sauce and mozzarella. When I bit into a hunk of that pizza, I thought I’d died and gone to heaven. On those days the lunch lines were long, and afterwards the kids would sit around the cafeteria with broad smiles on their faces, like boys drunk on first love. I now know there’s nothing fancy or exotic about that pizza – no caputo flour, no special sauce or toppings, no long kneading or gluten development. It’s just good, honest pan pizza made with a minimal number of ingredients. 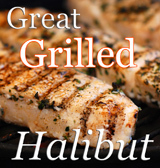 You’ll also find that it’s quick and easy to make. You can decide to make pizza at 4 p.m., and have this on the table in less than 3 hours, in time for dinner. 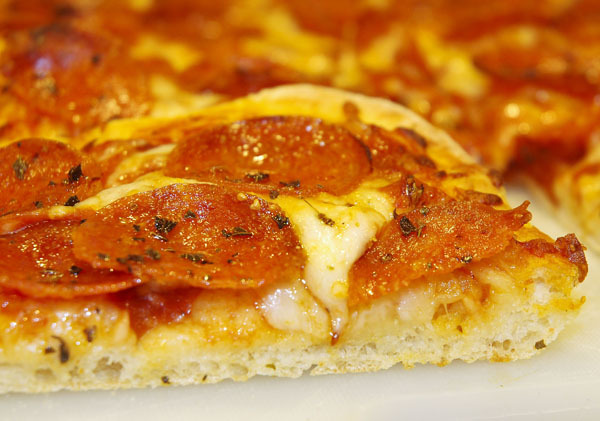 So here it is: a basic pan pizza you can really sink your teeth into. And go ahead – throw on some special toppings if you like. The Italian lunch ladies won’t mind! Make the dough: Put the yeast in a large mixing bowl and add a few ounces of the water. Stir to cream. Add all but a half cup of the water, all the flour and the 2 teaspoons salt. With the handle of a wooden spoon, scrape the sides toward the center to incorporate. Pour the rest of the water around the sides and over the flour, pull towards the center again with the wooden handle and make a ball. Knead the dough: Turn the dough ball out onto a lightly floured counter and knead for at least 5 minutes and preferably 10, using a small amount of flour as needed to keep the ball from sticking.Let rise: Clean and dry the mixing bowl. Sprinkle 2 teaspoons olive oil into the bowl, put in the doughball and turn to coat. Cover with a piece of plastic and a towel, and let rise for 1 ½ hours at 80º. You can create a warm environment in your oven by turning it on for 3 minutes only, shutting it down and putting a pan of boiling water on a low rack. Preaheat oven and prepare pans: Remove the bowl and water from the warm oven and preheat the oven to 475º. If you have a pizza stone, set it on a middle rack. Lightly oil 2 12×17 jelly-roll pans or rimmed cookie sheets and set within reach of your work surface. 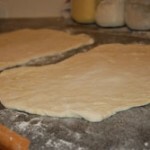 Roll out dough: Lightly flour your counter, cut the dough in half and spread out each half as best you can to form a rectangle. This dough is weak and tears easily, but don’t worry because as long as you get it close to the size of the pans, you can continue shaping in the pan. Turn each piece over the length of your forearm and plop it into the pan. 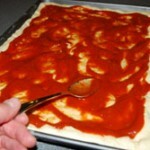 Spread uniformly with your fingers, leaving the dough somewhat thicker at the edges. Top the pizzas: Mix the tomato sauces together. Spoon half the sauce onto each pizza, smoothing with the back of the spoon, leaving half an inch of uncovered crust at the rim. If you like, distribute pepperoni, ham or olives. Otherwise, top each evenly with 8 ounces of grated cheese and then sprinkle with oregano. Bake the pizzas: Bake for about 12 minutes, until the cheese starts to brown. Baking times vary depending on your oven. Let sit for 5 minutes before cutting. Slice and enjoy! Note: If you have a convection oven and 12 quarry tiles, you can bake these pizzas at the same time on two racks as we do here at Chez Bullhog. Put one rack at the top of the fan (a little hire than center position) and the other 6” below, with quarry tiles on each. Be sure to preheat the oven for a good half hour at 475º, and lower the heat to 450º when the pizzas go in. Run the fan the whole time. I love what you made out of your blog. I never said thank you for all this wonderful great ideas you give us all the time.! Thank You! Hello there! You make me want to go to the store and get some bread flour today! I was going to go get some, but now you really make me want to get some and make this dough. I will always put my own marinara on the pizza and I vary it depending on what ingredients I see in the store that look good. I used to make home made very large, rustic pizza for Supter Bowl Sunday-when I was married. I used to put my bread maker to work to “make the dough” and I would shape it while I was doing other things. You have a very nice blog and you have some really interesting articles here! Job well done, and then some! 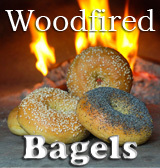 Stop by my corner of the food world and say hello some time! PS Of the pizza doughs that you have, what is your favorite for making Calzones?